Project Goal: To increase Andean tapir populations to stable levels and strengthen the management of the two largest parks in Ecuador harboring the remaining Andean tapir — Llanganates and Sangay National Parks. The Andean tapir is among the world’s most endangered large mammals and has a key role in sustaining plant diversity. Hunting, habitat destruction and cattle pose the greatest threats. It is perceived as dangerous and hunted, and it is believed to have aphrodisiac properties. In reality, it is a shy, gentle herbivore. The tapir has received little attention from governments in Ecuador and insufficient conservation actions. 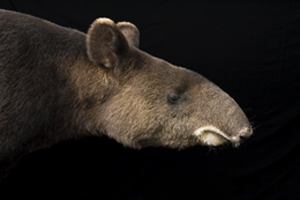 The Andean habitats where the tapir occurs are considered “global conservation hotspots,” having been destroyed over much of their extent but containing very high biodiversity. Llanganates and Sangay National Parks are thought to represent the greatest strongholds for Andean tapir populations in Ecuador, and are places where the species could make a comeback to more stable population sizes. Improved management of these parks are be beneficial for the conservation of many other plants and animals. This project had four major outcomes. The first was to increase scientific knowledge of the Andean tapir. Fieldwork and photo-documentation were conducted and determined the size of, location of, and threats to the remaining tapir populations in Ecuador. Finding Species and collaborating scientists are undertaking field photo-documentation and camera trapping of the tapir in remote locations as part of this work. The second outcome was to enlist community support. Finding Species conducted an outreach campaign to local communities surrounding Llanganates and Sangay National Parks, about the endangered status of the tapir and its biological value and lack of harm to humans. We engaged communities to reduce their hunting and ranching activities in the parks that threaten the tapir. The third was to improve local and national policies and laws, by educating local and national government officials about policy and legal changes that would better protect the tapir and other endangered plants and animals. The fourth outcome was to improve government management practices in the national parks where the tapir is found. Park rangers and other federal and local government agency officials must be engaged in actively reducing hunting and cattle ranching activities in the parks, increasing plant cover, and creating safe biological corridors and buffer zones for migration of the species. Finding Species has educated these officials through workshops, and has made the tapir a flagship species in the Baños region based on its unusual charisma and importance to Andean ecosystems. The project has been carried out by a strategic alliance between Finding Species, the Oscar Efrén Reyes Foundation, the Amazonian-Fatima Technological Resources Center, and scientists from the the IUCN Tapir Specialists Group, and has the support of the Ecuadorian Ministry of Environment and the U.S. Fish and Wildlife Service.